Brunswick frock, Nuns bonnet, Buff gloves. Regency fashion 1795. Home » Brunswick frock, Nuns bonnet, Buff gloves. Regency fashion 1795. 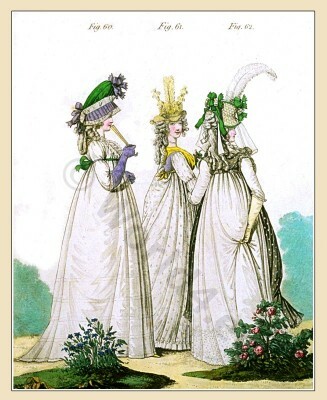 Morning Dresses July 1795. The Gallery of Fashion Vol. 2. Published by Nikolaus von Heideloff, London. Georgian fashion era. Neoclassical costume in the time of Jane Austen. The hair frizzed into light curls; the hind hair turned up plain. Nuns bonnet of lilac taffeta, the cawl of green taffeta, trimmed with white blonde and lilac ribands. Brunswick frock of clear lawn, with five tucks at the bottom. Short loose sleeves, trimmed with lace, and tied in the middle with a narrow lilac riband. Full plaiting of broad lace round the neck. Sash of green riband. Gold ear-rings. Lilac gloves. Yellow shoes. The hair in light curls and ringlets. Straw hat, trimmed with straw band, feathers, and tassels. Round gown of embroidered muslin, flounced at the bottom. Short fun sleeves, drawn in the middle of the arm. Body of lilac taffeta. Yellow handkerchief, crossed in the front, and tied behind. Gold ear-rings. Grey gloves and shoes. The hair in light curls; the hind hair in ringlets. Hat made of white silk and straw, trimmed with variegated ribands. White ostrich feather placed on the left side. Veil of white clear lawn. Round gown of clear lawn embroidered at the bottom; short sleeves, trimmed with the same. Black spotted gauze cloak, cut out for the arms; the hind part square, tied to the waist with a riband, and the whole trimmed with a broad lace. Buff gloves. Green and purple striped shoes.